吕茹洁, 商庆银, 陈乐, 曾勇军, 胡水秀, 杨秀霞. 基于临界氮浓度的水稻氮素营养诊断研究[J]. 植物营养与肥料学报, 2018, 24(5): 1396-1405. LV Ru-jie, SHANG Qing-yin, CHEN Le, ZENG Yong-jun, HU Shui-xiu, YANG Xiu-xia. Study on diagnosis of nitrogen nutrition in rice based on critical nitrogen concentration[J]. Journal of Plant Nutrition and Fertilizers, 2018, 24(5): 1396-1405. Abstract: 【Objectives】 Nitrogen nutrition index (NNI) and nitrogen deficit (Nand) value are two indicators in diagnosing nitrogen nutrition of rice. The NNI and Nand values of inbred and conventional rice cultivars under different nitrogen supply levels were calculated and compared in this paper, in order to achieve precise and quantitative control of crop nitrogen status. 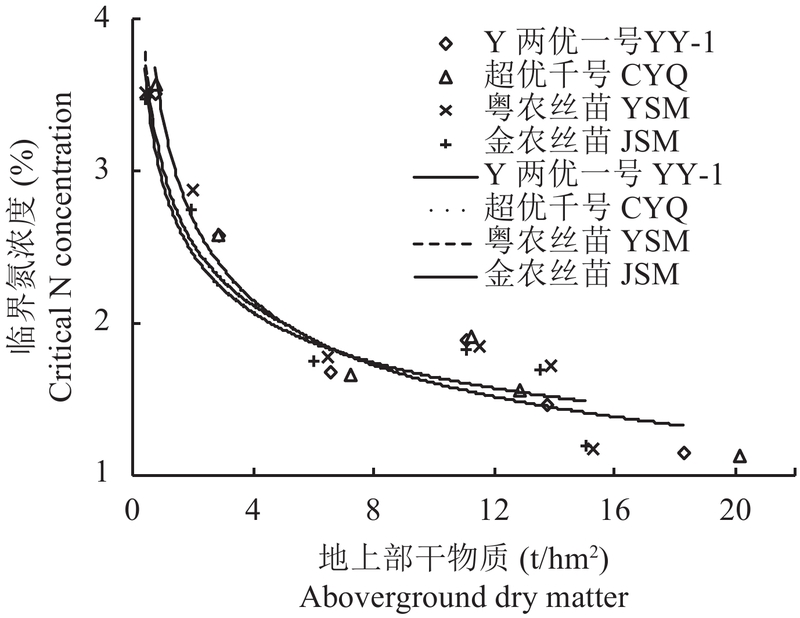 【Methods】 Super-high-yield hybrid rice cultivars (YY-1 and CYQ) and conventional rice cultivars (YSM and JSM) were selected as materials in a field experiment. Nitrogen application levels of 0, 40, 80, 120, 160, 200 and 240 kg/hm2 (expressed as N0, N40, N80, N120, N160, N200, and N240) were set up for each cultivar, the dry matter weight and nitrogen concentration of aboveground parts were investigated 15, 30, 45, 60, 75 days after transplanting, and at mature period, the critical nitrogen concentration curves were constructed. The curves were used to calculate the critical nitrogen concentration, the nitrogen index and nitrogen deficit value in different stages of plant for different species. 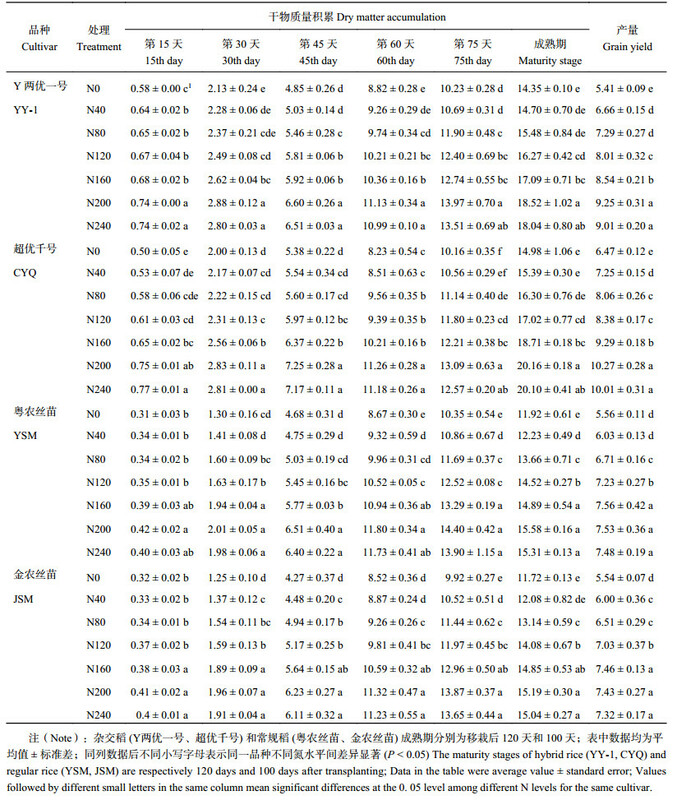 【Results】 For hybrid rice, N0, N40, N80, N120, and N160 treatments showed significant differences in dry matter weight, N200 and N240 treatments had no significant difference but were significantly higher than those of N0, N40, N80, N120 and N160 treatments; for conventional rice cultivars, there was significant difference in dry matter weight of shoots among treatments N0, N40, N80 and N120, there was no significant difference among N160, N200 and N240 treatments, but the shoot dry weights in N160, N200 and N240 were significantly higher than those in N0, N40, N80 and N120 treatments. The nitrogen concentration of rice plant increased with the increase of nitrogen application rate, but the nitrogen concentration of rice plants showed a decreasing trend with the extension of growth period and the increase of aboveground dry matter weight. 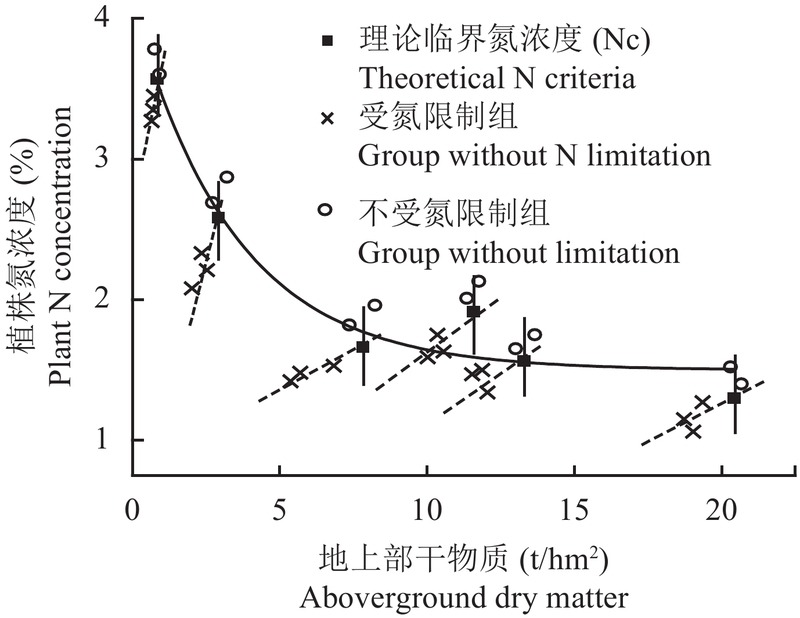 The critical nitrogen concentration curves of rice were constructed according to the aboveground dry matter weight and its nitrogen concentration, Nc=3.36DM–0.31 (R2=0.91) for hybrid rice, Nc=2.96DM–0.25 (R2=0.86) for conventional rice. The NNI and Nand values were calculated based on the critical nitrogen concentration curves. The NNI range was from 0.73 to 1.05 for hybrid rice and from 0.78 to 1.11 for conventional rice; and the Nand value was –9.8 to 117.8 kg/hm2 for hybrid rice and –25.4 to 90.3 kg/hm2 for conventional rice. 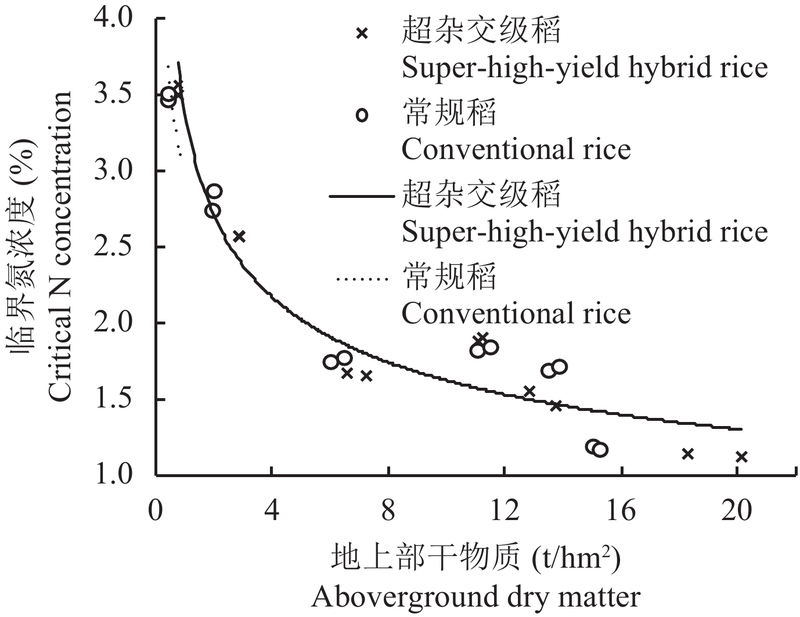 【Conclusions】 The critical nitrogen concentration of conventional rice is higher than that of hybrid rice at the same growth stage, while the dry matter weight of hybrid rice is higher than that of conventional rice. Under the experimental conditions, the nitrogen accumulation in the critical nitrogen concentration of hybrid rice is larger than that of conventional rice according to the results of Nand calculation, the suitable nitrogen application rates of hybrid rice and conventional rice are about 200 kg/hm2 and 160–200 kg/hm2, respectively. 注（Note）：杂交稻 (Y两优一号、超优千号) 和常规稻 (粤农丝苗、金农丝苗) 成熟期分别为移栽后 120 天和 100 天；表中数据均为平均值 ± 标准差；同列数据后不同小写字母表示同一品种不同氮水平间差异显著 (P < 0.05) The maturity stages of hybrid rice (YY-1, CYQ) and regular rice (YSM, JSM) are respectively 120 days and 100 days after transplanting; Data in the table were average value ± standard error; Values followed by different small letters in the same column mean significant differences at the 0. 05 level among different N levels for the same cultivar. 龚金龙, 邢志鹏, 胡雅杰, 等. 籼、粳超级杂交稻氮素吸收利用与转运差异研究[J]. 植物营养与肥料学报, 2014, 20(4): 796–810. Gong J L, Xing Z P, Hu Y J, et al. Differences of nitrogen uptake, utilization and translocation between indica and japonica super rice [J]. Journal of Plant Nutrition and Fertilizer, 2014, 20(4): 796–810. 陈露, 杨建昌. 氮肥对超级杂交稻产量的影响及其生物学基础的研究进展[J]. 作物杂志, 2012, (6): 19–24. Chen L, Yang J C. Research advances on effect of nitrogen on grain yield of super rice and its biological basis[J]. Crops, 2012, (6): 19–24. 龚金龙, 胡雅杰, 葛梦婕, 等. 南方粳型超级杂交稻氮肥群体最高生产力及其形成特征的研究[J]. 核农学报, 2012, 26(3): 558–572. Gong J L, Hu Y J, Ge M J, et al. The highest population productivity of N fertilization and its formation characteristics on japonica super rice in south China [J]. Journal of Nuclear Agricultural Sciences, 2012, 26(3): 558–572. 巨晓棠, 谷保静. 我国农田氮肥施用现状、问题及趋势[J]. 植物营养与肥料学报, 2014, 20(4): 783–795. 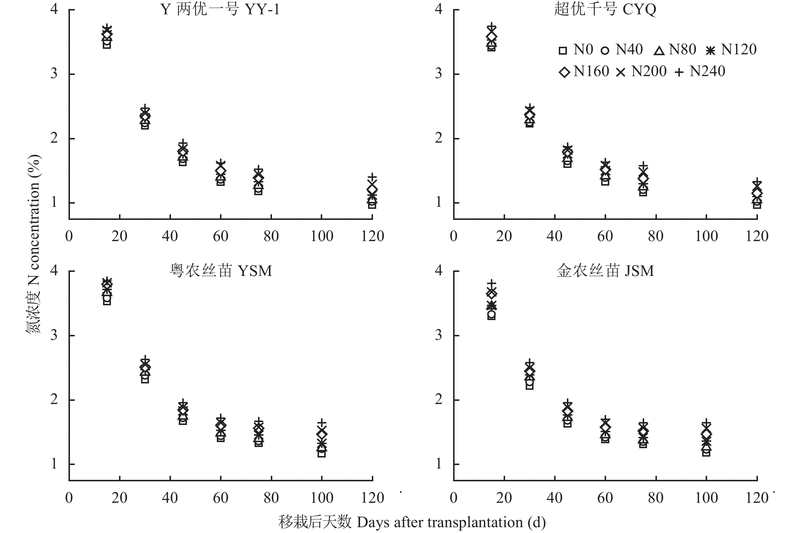 Ju X T, Gu B J. Status-quo, problem and trend of nitrogen fertilization in China[J]. Journal of Plant Nutrition and Fertilizer, 2014, 20(4): 783–795. 王敬国, 林杉, 李保国. 氮循环与中国农业氮管理[J]. 中国农业科学, 2016, 49(3): 503–517. Ulrich A. Physiological bases for assessing the nutritional requirements of plants[J]. Annual Review of Plant Physiologic, 1992, 3(1): 207–228. Lemaire G, Gastal F, Cruz P, et al. Relationships between plant-N, plant mass and relative growth rate for C3 and C4 crops [A]. Scaife A. Proceedings of the first ESA congress [C]. Paris: European Society of Agronomy, 1990. 1–5. 薛晓萍, 周治国, 张丽娟, 等. 棉花花后临界氮浓度稀释方程的建立及在施氮量调控中的应用[J]. 生态学报, 2006, 26(6): 1781–1791. 梁效贵, 张经廷, 周丽丽, 等. 华北地区夏玉米临界氮稀释曲线和氮营养指数研究[J]. 作物学报, 2013, 39(2): 292–299. Lemaire G, Gastal F, Salette J. N uptake and distribution in plant canopies: diagnosis of the nitrogen status in crops [M]. Berlin: Springer, 1997. 3–43. Naud C, Mkowski D, Jeuffroy M H. Is it useful to combine measurements taken during growing season with dynamic model to predict the nitrogen status of winter wheat?[J]. European Journal of Agronomy, 2008, 28: 287–300. 贺志远, 朱燕, 李艳大, 等. 中国南方双季稻氮营养指数及产量估算方程研究[J]. 南京农业大学学报, 2017, 40(1): 11–19. He Z Y, Zhu Y, Li Y D, et al. Study on estimation model for nitrogen nutrition index and yield on double cropping rice in southern China[J]. Journal of Nanjing Agricultural University, 2017, 40(1): 11–19. 王远. 基于可见光图像的水稻氮素营养诊断和推荐施肥研究[D]. 北京: 中国科学院大学博士学位论文, 2015. Wang Y. Based on visible light image of rice nitrogen nutrition diagnosis and recommended fertilization research [D]. Beijing: PhD Dissertation, Chinese Academy of Sciences University, 2015. 刘小军, Ata-Ul-Karim S T, 陆震洲, 等. 水稻临界氮浓度稀释方程及氮素营养诊断研究[J]. 中国稻米, 2013, 19(4): 149. Liu X J, Ata-Ul-Karim S T, Lu Z Z, et al. Critical nitrogen concentration diluted rice model and nitrogen nutrition diagnosis[J]. China Rice, 2013, 19(4): 149. 夏冰, 蒋鹏, 谢小兵, 等. 超级杂交稻与常规稻产量形成及养分吸收利用的比较研究[J]. 中国稻米, 2015, 21(4): 38–43. 艾志勇, 马国辉, 青先国. 超级杂交稻生理生态特性及高产稳产栽培调控的研究进展[J]. 中国水稻科学, 2011, 25(5): 553–560.